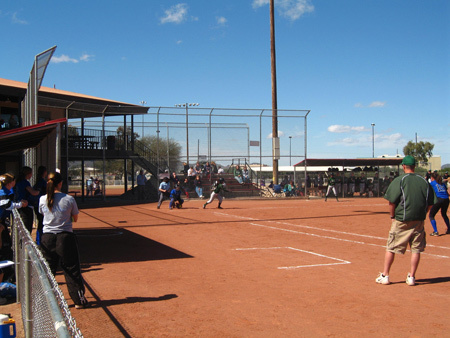 Mike Jacob Sportspark re-opened on a limited basis for league and tournament play March 8 and will stay open through June 30, according to Pima County Natural Resources, Parks and Recreation staff. A team of architects and engineers is currently conducting an in-depth condition analysis, including infrastructure, of the park, 6901 N. Casa Grande Highway, that will form the basis for renovation and construction plans. During this analysis, the park will remain open. Upon completion of construction plans, the park may experience complete or partial closures to conduct construction activities. More information will be available later this spring, and every effort will be made to facilitate league and tournament activities whenever possible during this process. The Pima County Board of Supervisors voted at its Dec. 13 meeting to make up to $1 million in capital improvements at Mike Jacob Sportspark, 6901 N. Casa Grande Highway, using funding from the Arizona Department of Transportation’s right-of-way acquisition as part of I-10/Ina Road construction. For tournament reservations, please contact Martina Gonzales at 724-5207. To join a softball league, contact Jesus Morales at 238-9881, or visit the Facebook page for AMI-Sport-Complex-AZ. To join a volleyball league, contact Rocio Casanova at 333-5862 or visit the Sportspark website. For other sports, contact Julie Vaughn at 631-4256, or visit the Xtreme Fun Spot BMX website. For all other information, contact Joe Barr, NRPR recreation superintendent, at 724-5150.